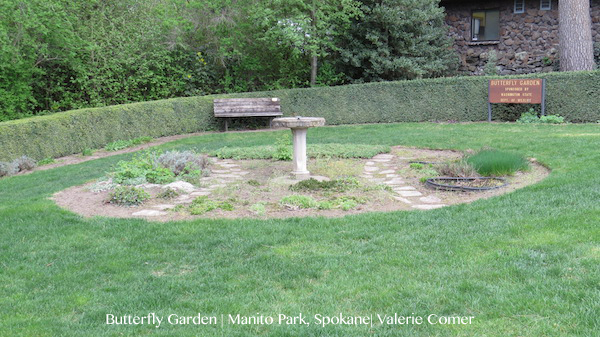 Butterflies on Breezes takes place in the city of Spokane, Washington, which is close enough to where I live in Canada for day trips. My husband and I have popped down twice to do specific research for the Urban Farm Fresh Romance setting. I blogged at valeriecomer.com in May about the real life neighborhood of Pleasant Valley that I morphed into my fictional neighborhood of Bridgeview, the main setting for the entire series. 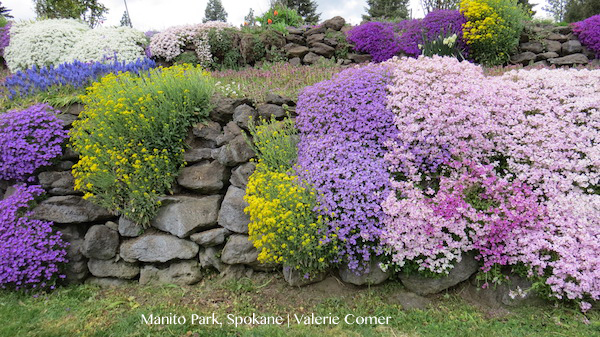 Today I want to share Manito Park with you. It’s a spot that Linnea visits several times during Butterflies on Breezes. It’s her oasis, her calm in the storm, and her inspiration as a landscape designer. These photos were taken in April, so I had to “guess ahead” for what would be in bloom during Linnea’s visits in summer and autumn. The rose gardens had been about to bloom the last time she’d taken time to walk through them. Today the heady fragrance permeated the air. 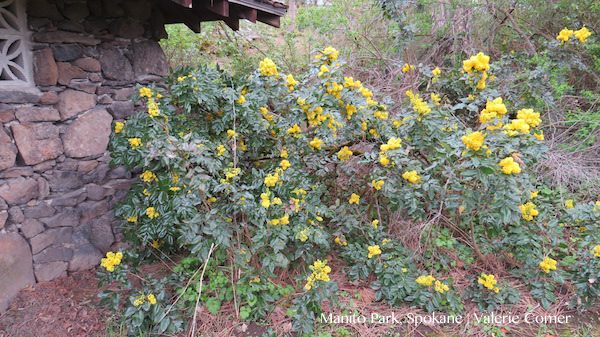 Linnea breathed deeply, filling her lungs with the sweet scent from the thousands — maybe millions — of riotous blossoms in every color and every variety that could possibly grow in the Inland Northwest. She walked reverently down the grassy center toward the sundial and pergolas at the far end. 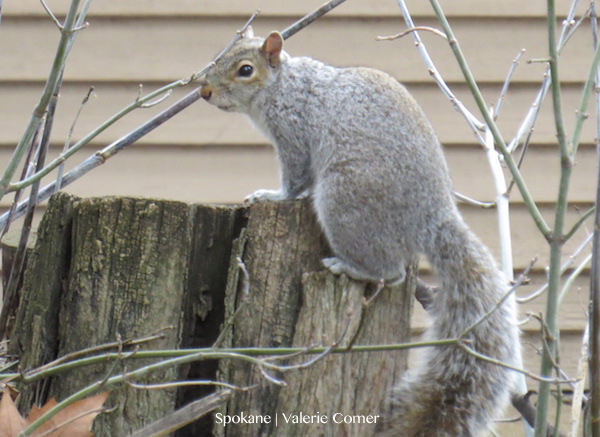 A fat gray squirrel darted between the bushes and disappeared amid the conifers beyond. A waterfall tumbled into the pond behind them, barely rippling either the surface or the muted sounds. Linnea was silent for so long he turned her to face him, looping both hands around her waist. “Really? Marietta’s lot is your first? It’s going to look fantastic. I wouldn’t have thought of using native stone instead of decorative concrete blocks, but I see where you got the idea from.” Gray basalt outcroppings had been left throughout Manito by the park developers in the early twentieth century, yet plenty also edged walkways and created the park’s headquarters and other buildings. Linnea crouched in the butterfly garden at Manito Park and lifted a milkweed leaf. She caught her breath. There. A monarch chrysalis. This little beauty would migrate to California and warmer climes soon, unlike the season’s earlier generations who lived their entire short lives right here. Was there a lesson to be learned from the life cycle of butterflies? If you’ve already read Butterflies on Breezes, I hope you enjoyed this glimpse of one of the settings! And if you haven’t read it yet… I hope these tiny snippets intrigue you to give the story a try. 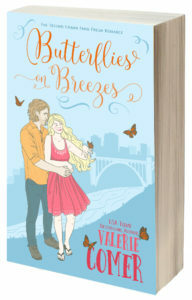 Butterflies on Breezes is available in e-book at Kindle, Kobo, Nook, and iBooks. Click here. What a beautiful area, Val. I enjoyed the excerpts and your photos are beautiful! Thank you! I love using real settings as much as possible. My camera gets a workout! Hi Valerie! Thanks for sharing your beautiful pictures that you described so well in your inspirational romance Butterflies on Breezes. I enjoy visiting Japanese, rose, and butterfly gardens. Looking forward to your next Urban Fresh story – Memories of Mist. 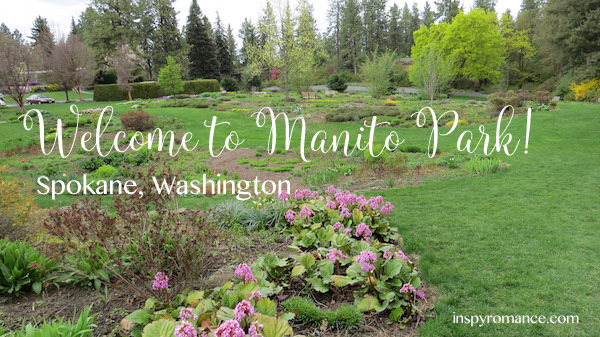 You’d enjoy Manito Park! I was hoping to make it back in the summertime, but too much camping with the grandkids. Not that there’s such a thing as “too much” of that. I can’t wait to get writing on Memories of Mist! The pictures are gorgeous. It was fun to see them. I read and enjoyed the story shortly after it came out. What a lovely trip via the book and the pictures! I’d love to visit there but can’t, so I guess the book will have to do for now. Thanks for sharing. Thank you Carolyne! It’s a beautiful place, and I hope the story did it justice. Oh, we are DEFINITELY gonna have to go to that park when I come to visit you….. wink wink!! Can’t wait to get my hands on Butterflies !!! Thanks! I try to take as many as possible, because I flip through the digital album while I’m trying to describe a scene. 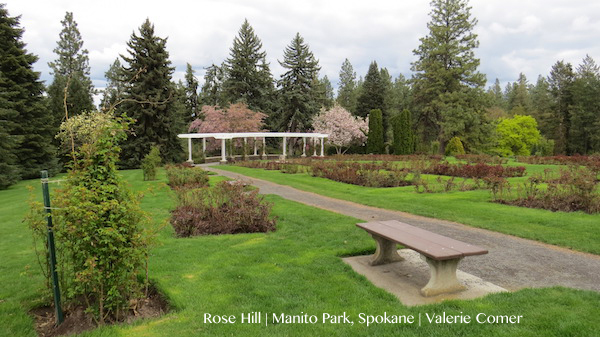 I have over 200 photos of Manito Park taken in the space of a couple of hours! My In-Laws live in Spokane (on the south hill) and we travel there at least three times a year. 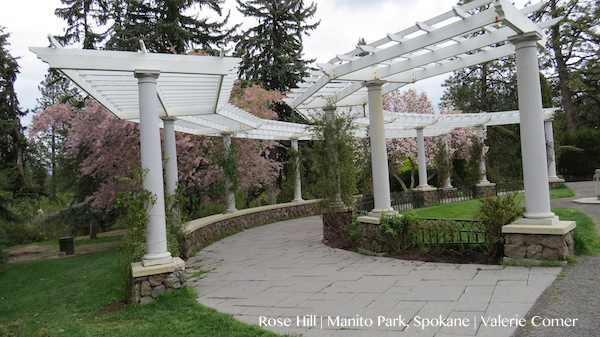 I love Manito Park and all the beautiful home around it too. Have you ever seen the park in the winter? They have a Christmas lights show in the atrium. My mother in law actually helps keeps the Japanese gardens picked up every once in a while. They are part of a Japanese church that takes a time to help. Thanks for sharing the photos and excerpt. No, I haven’t seen the park in winter! We’ll have to get down there sometime. The atrium was lovely to visit as well, but didn’t make it into Butterflies on Breezes. So cool to hear how your in-laws volunteer in the garden! Lovely photos, Valerie. They are a little touch of home for me. Although Spokane hasn’t been home to me for many years, the first book I sold to Love Inspired is set in my fictional town of Pinecrest, which is located north of Spokane. I still have two brothers and nieces and nephews who live in Spokane. I just attended my 50th class reunion there this summer. My mother loved to visit Manito Park. Cool, Merrillee! If I’d have known you were so close I would have tried to connect! Which book is set in Pinecrest? I’ll have to look it up. Merrillee, by any chance do you know Bob Silver? He’s married to one of my college roommates, and we just visited them in Spokane in July. They picked us up at the train station right after his 50th class reunion… Just curious! Valerie, next time I’m planning a trip to Spokane, I’ll let you know. I didn’t know you lived so close. I actually have three books set in Pinecrest. Love Inspired never labeled them as a series, but there are three that are actually set there. The Heart’s Homecoming, Love Walked In, The Heart’s Forgiveness. Also Montana Match is the story of one of the teenage secondary characters from that series. So lovely. And you did a great job describing them in the book! 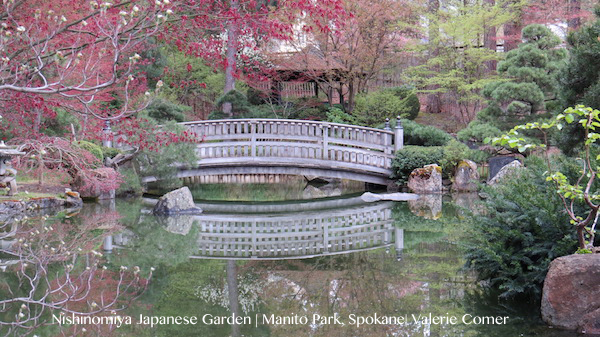 Valerie, we got to visit Manito Park in July when visiting college roommates! It was so fun to know what it looked like as I read Butterflies on Breezes! Oh, that’s terrific! I’m glad you enjoyed it. Valerie, lovely photos :) Thanks for sharing the inspiration for your setting with us. Beautiful photos! Loved reading the excerpts, looking forward to reading the book! I love all the beautiful parks in Spokane! The parks make it a lot easier to breathe when this small town girl goes for a visit! Big cities are not my cup of tea, too peopley! I’m reading book 1 & 2 within the next few weeks!